Operacion Grial, the next Operacion Puerto doping ring. A ghost from Kelme. Walter Viro. 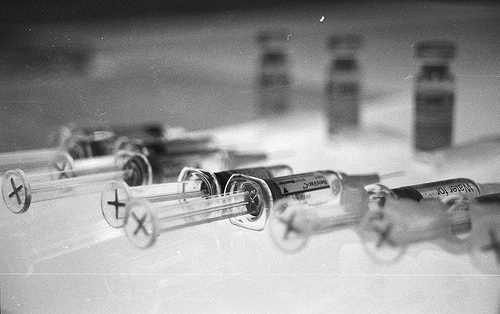 The sharpest needle in the doping haystack. New cycling expression: “You’re Kelme-ing me.” A twist on the drug infested old Kelme team and used to express disbelief, frustration and shock at the never-ending revelation of Spanish doping rings. Next up, Walter Viro and Operacion Grial. Get ready to see the name Walter Viru a hundred times in the next six months as this drug story unfolds. He’s the Man with the Syringe, the head of yet another doping ring uncovered by the Spanish Guard Civil. It’s the usual stuff we know so well in the Post-Peurto world: raids, illegal products, riders, doctors, pharmacists taken in for questions, computers and cell phones seized. A total of a dozen people in custody already in Barcelona, Valencia, Murcia (shout out to home boy Alejandro Valverde!) and Granada. Walter was a former collaborator with Fuentes at syringe-central, the Spanish Kelme team. Remember those disgraced green boys Roberto Heras, Oscar Seville, Aitor Gonzales? Yeah, that team. Let’s just agree to wipe every result any Kelme rider had in their drug run from from 1980 to 2006. Jesus Marzano, former Kelme rider and whistle-blower, claims Viro had a close relationship back in the day with one of the four UCI approved Spanish testing labs. “The owner of this clinic, a renowned hematologist, called Walter Viru, who is one of the doctors for Kelme, [in order] to alert them the day before the UCI vampires were coming to take the samples from the cyclists,” said Marzano. Twisted Spoke begins to think even we could uncover a Spanish doping ring since they seem to be everywhere. We’d simply slip on a Caisse d’Eparne jersey, wander into any pharmacy and whisper “pssst, Alejandro sent me. My legs feel heavy.” If we asked “Donde esta Doping Ring?” at the local tourist information booth, they’d probably point us in the right direction. The Operacion Peurto story began in May of 2006 and drags on to this day without any conclusion in sight. Will be still be talking about Walter Viro in 2012? We have Jesus and Grial, the Spanish word for “grail” so perhaps someday we might get the holy truth. « Schleck cobbles together a plan to win 2010 Tour de France.